The sixth in a series of collectible ornaments featuring the Pembroke Welsh Corgi from the PWCCA Charitable Trust. 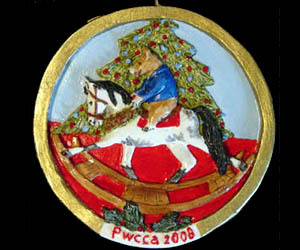 The 2008 Ornament, designed by Liisa Coit, depicts a Pembroke in riding a hobby horse in front of a Christmas Tree. Please choose "Domestic" or "Foreign" shipping.